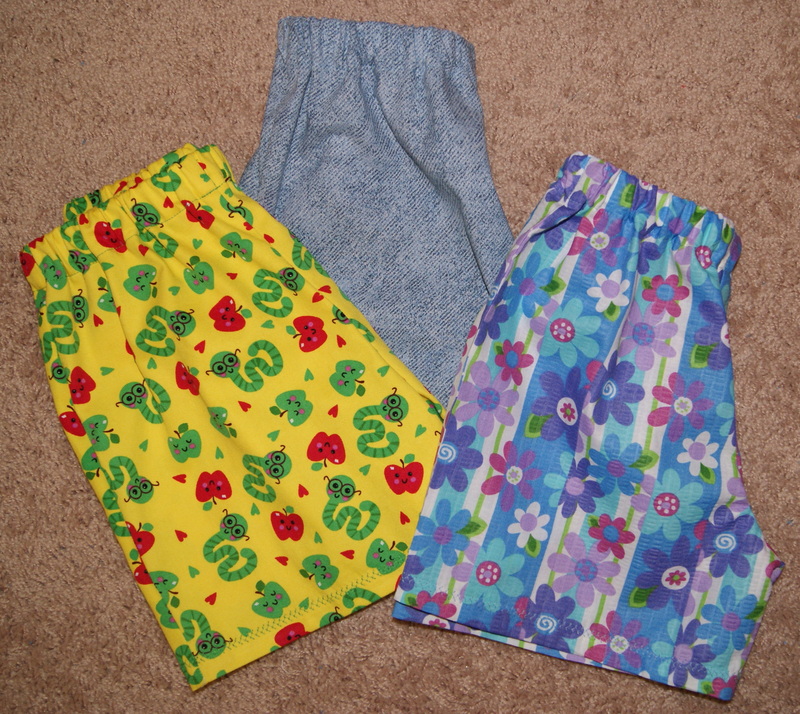 Making elastic waisted shorts for children is really easy, quick and fun!! You can actually get a pair of size 5 shorts out of a half of yard of cotton fabric and if you find some cute fabric among the remnants, WOW. Prewash your cotton fabric to allow for any shrinkage and cut out your short pattern, (2) fronts and (2) backs and be sure to make clip cuts to mark your notches. At this point too, I always place a pin in one of the back short fabric pieces because I serge all my seams and will serge off the notch placements. 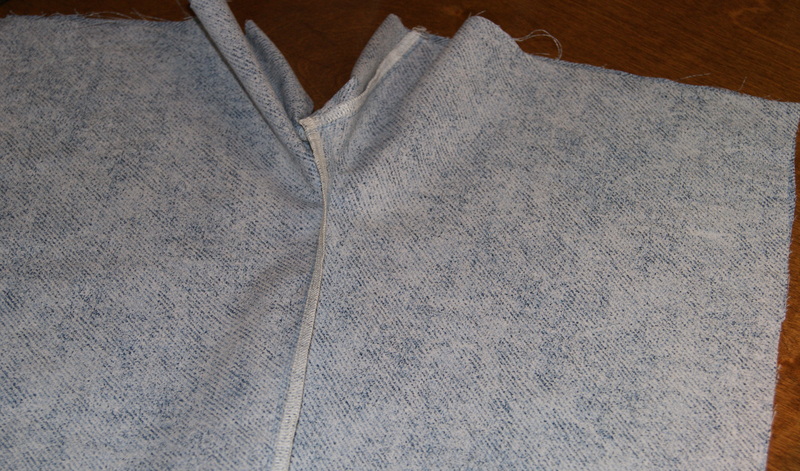 It is important to ensure that you don’t accidentally sew a front piece to a back piece at the center seam. The fronts will always only have one notch (maybe two) and the backs will always have two notches (maybe three). Anyways, all patterns are notched with less notches for the fronts and more notches for the backs. 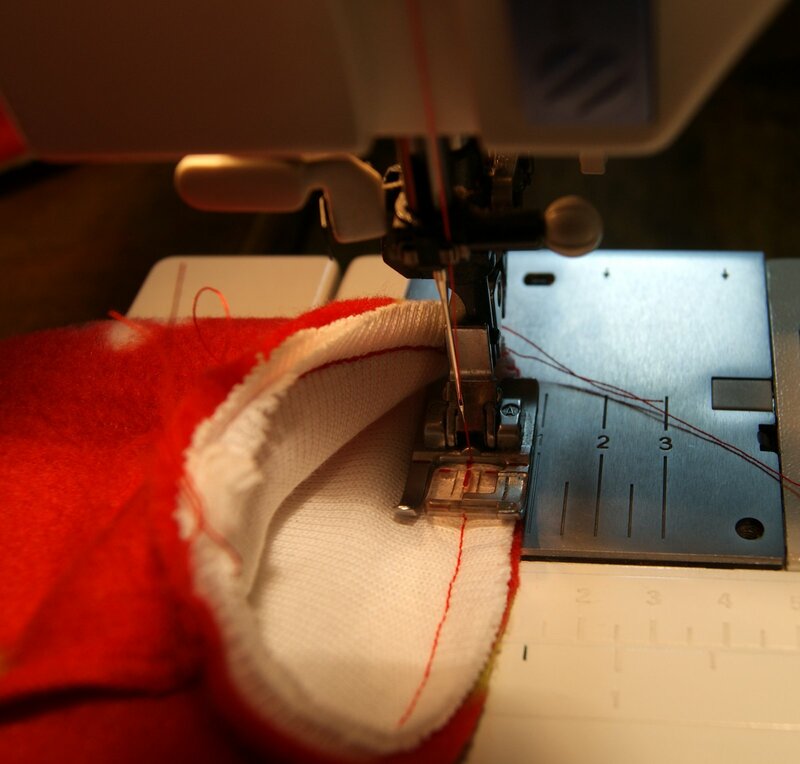 Now you want to begin sewing your shorts by first placing one front piece to one back piece, right sides together and only sew the inner leg seam. You will do that same sewing for the other front and back piece. I like to then serge both of those seams for a clean edge. 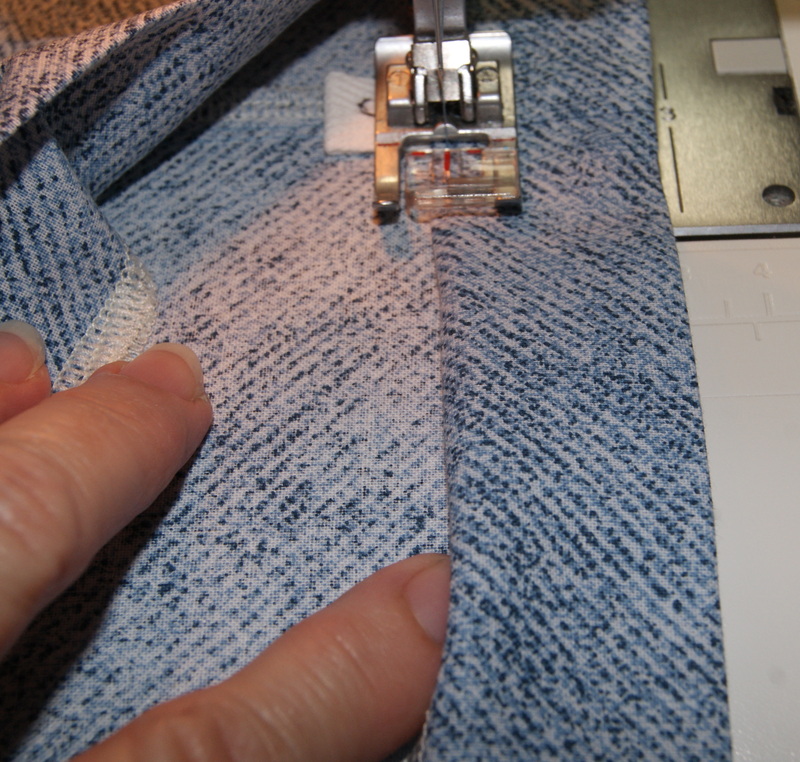 If you don’t have a serger, you can just press open your seams. Next you will want to pin the right sides together matching both front pieces to each other and both back pieces to each other. 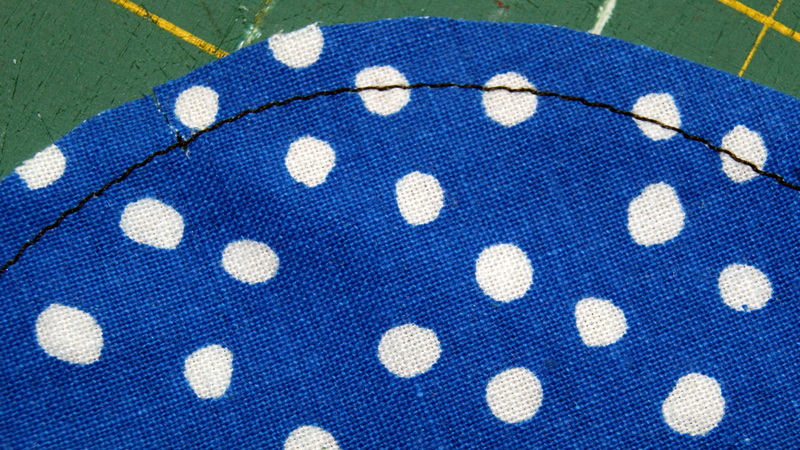 You will want to sew that seam twice. 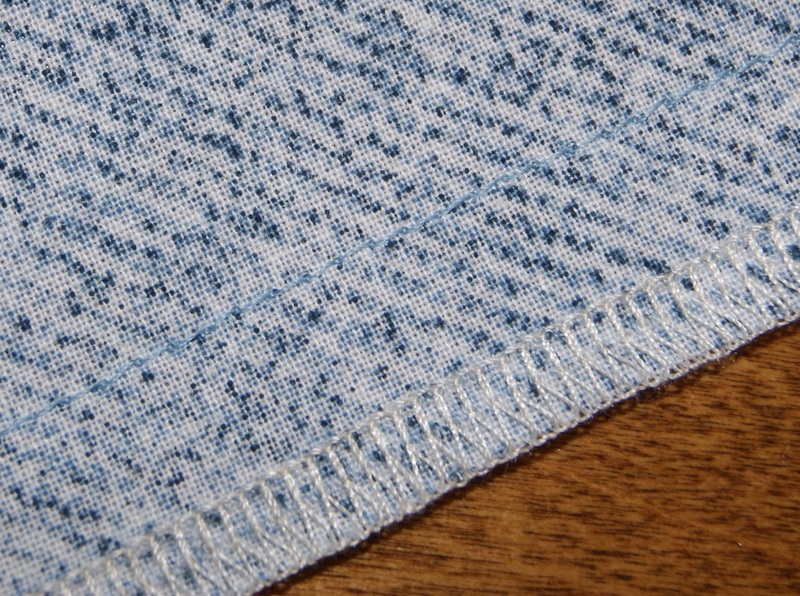 I make my first seam at the usual 5/8″ from the edge and come back and stitch again about 1/2″ from the edge. Just extra stitching support for a well used seam. I now serge that seam too or you can again just press open as far down as possible. 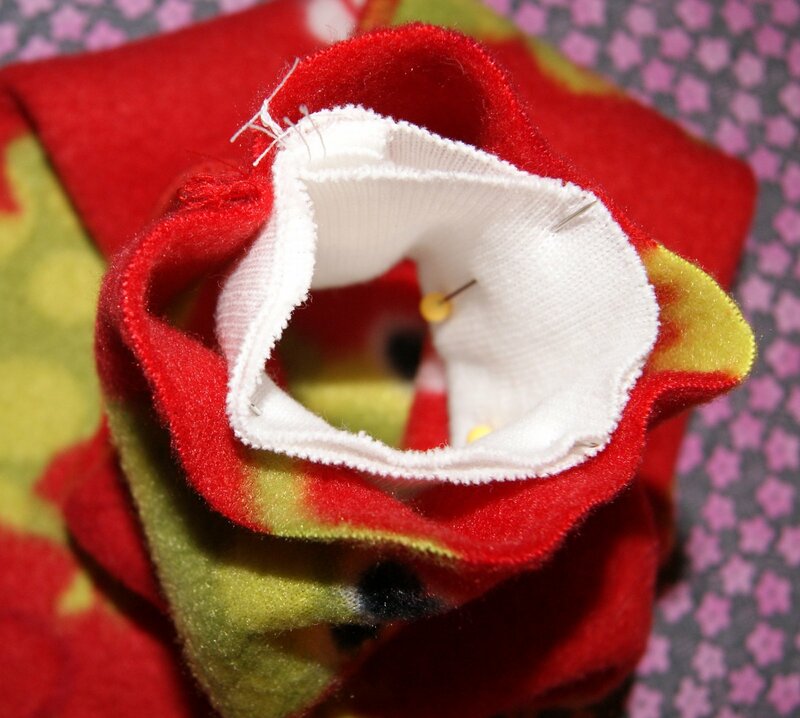 Now you will want to sew the side seams together. 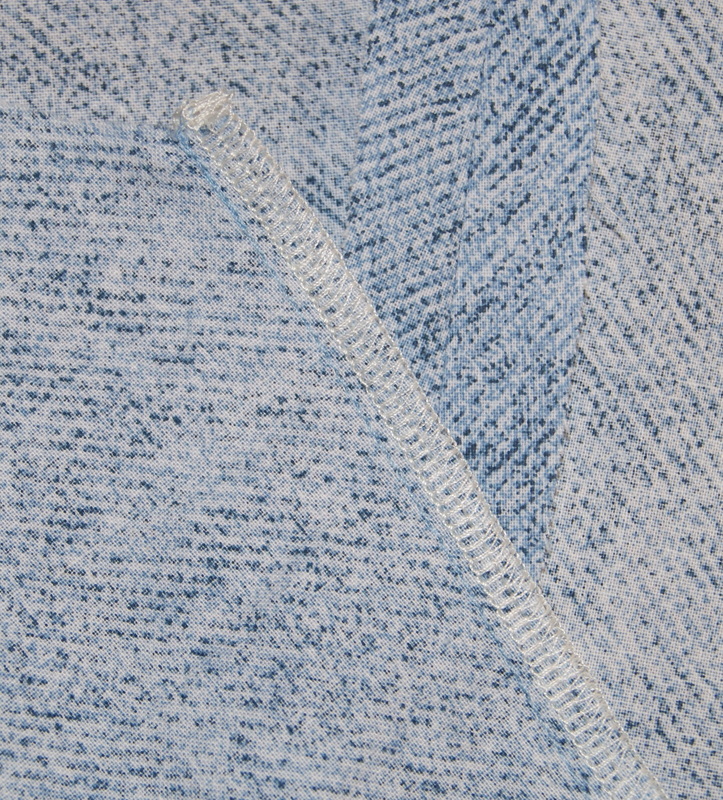 Matching front and back side seams on both sides (right sides together) stitch your 5/8″ seam and then serge or again press your seams open. At this point, I like to serge the edge of the shorts where the hem will be and serge along the top/waist which will be folded over for the elastic. 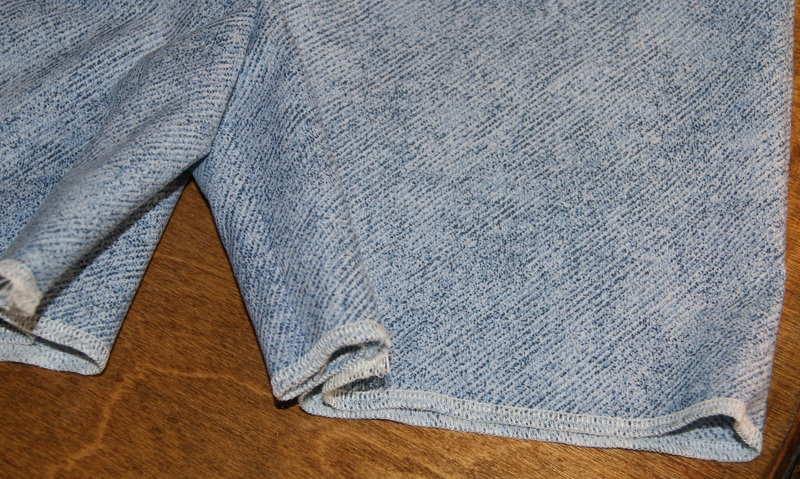 If you don’t have a serger, a close zigzag stitch will work too. At this point, I will machine stitch the bottom hem for both legs. 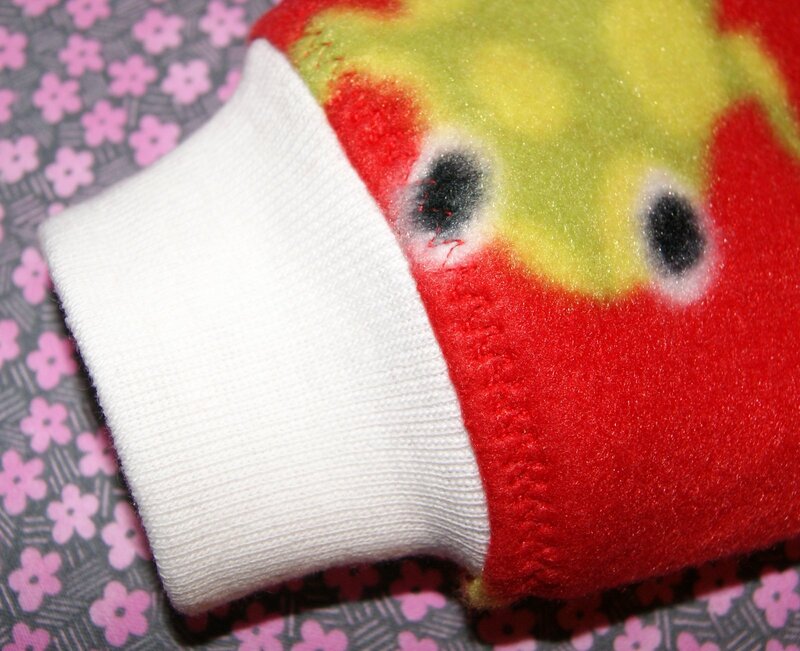 I sew a 5/8″ stitching line from the bottom edge of the short leg, either on the right side or wrong side of the fabric. 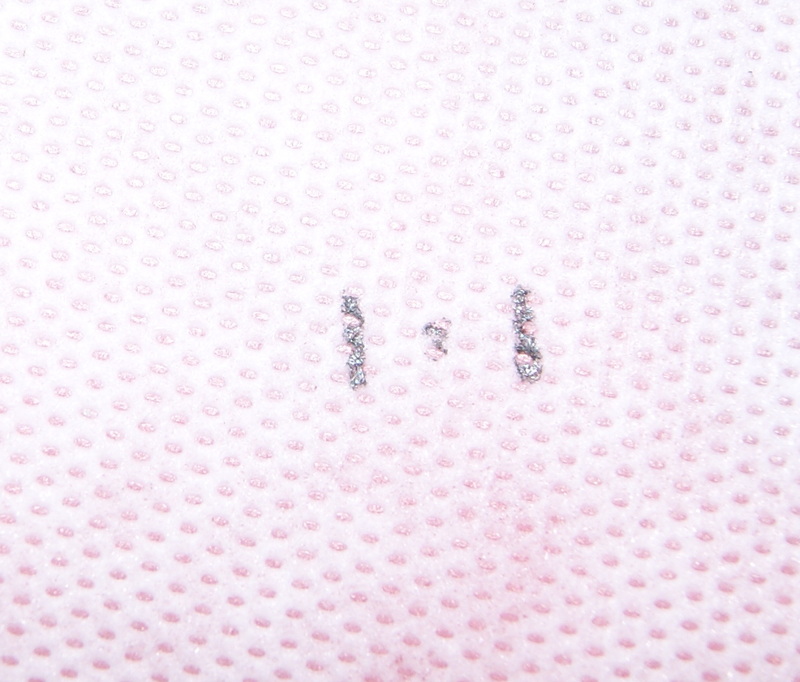 This stitching will be used to mark the hem. I then take the shorts to the ironing board and press that hem up along the stitching line making sure the stitching itself folds over to the wrong side. Press all the way around the leg opening, no pins needed. Now go back to the sewing machine and stitch the hem in place. 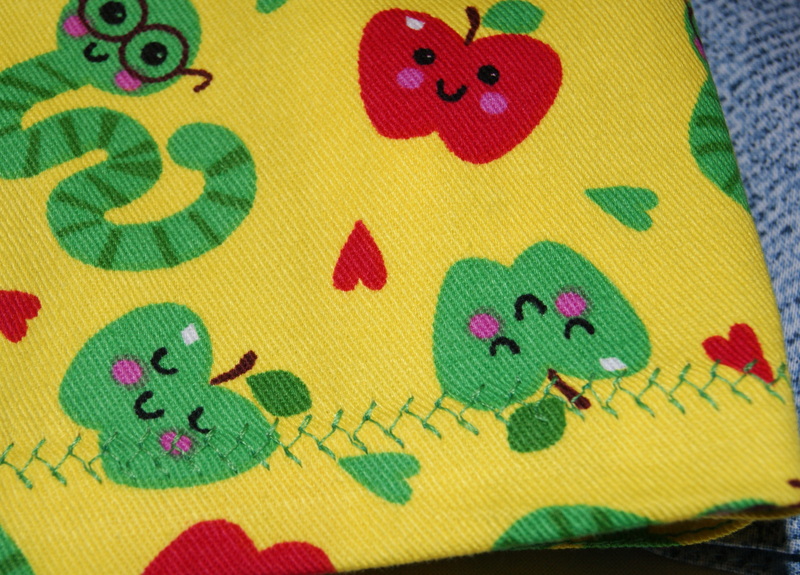 This is a great time to use some of your decorative stitches or sew two lines of straight stitches about 1/4″ apart for a nice finished look for the hem. Last step is to make the waist band. 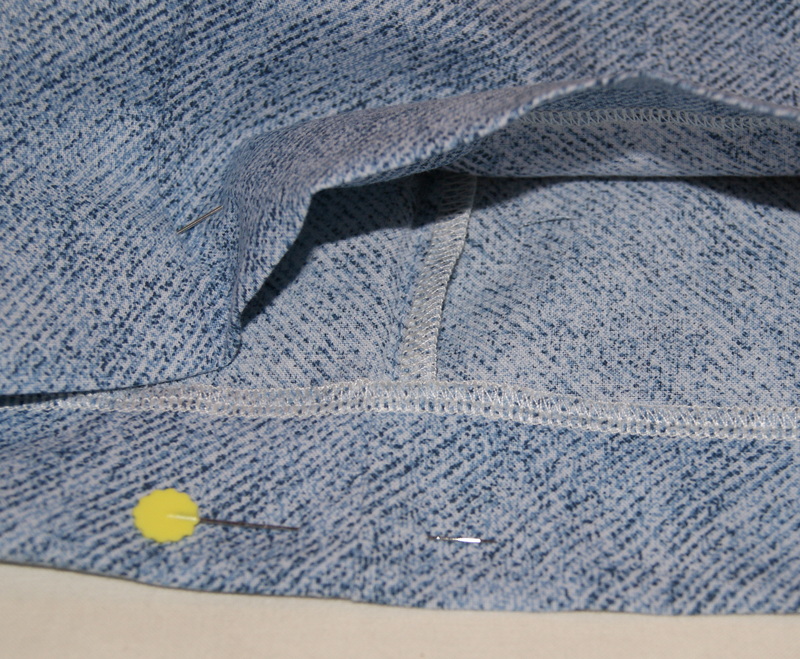 Fold over a 1 1/2″ hem along the top and press into place and use about 4 pins to hold it there. I use a piece of cotton twill tape and write the size info with a black permanent marker and place it at the center back seam. 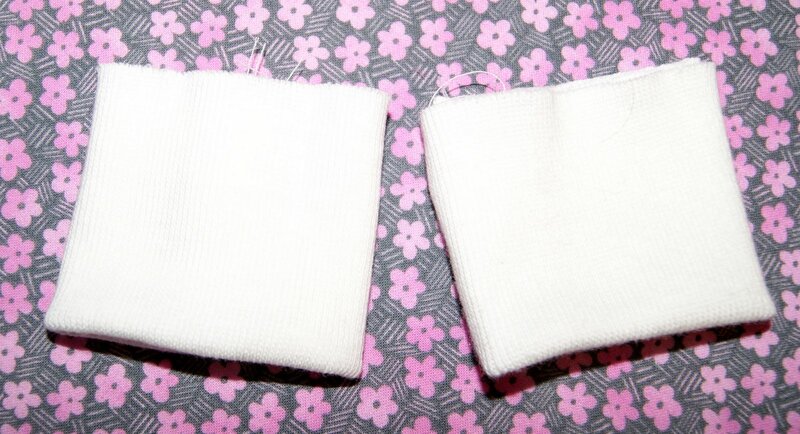 Stitch your waist band, folding under the serged edge as you go and leave about a 2″ opening for elastic. Cut your elastic 1″ smaller than the waist size, insert into opening and overlap it about 1/2″ on each side and zigzag in place at both raw edges. You want the elastic to stretch a little when wearing so it doesn’t slide down. Adjust your gathers so they are evenly spaced. To keep the gathers from shifting, I sew a stitching line (stitching in the ditch) along all four seams lines around the shorts. You will find that you can make a pair of shorts in about 45 minutes. Stack a couple of fabrics on top of each other and rotary cut them out so you have about 3 pairs ready to be stitched. 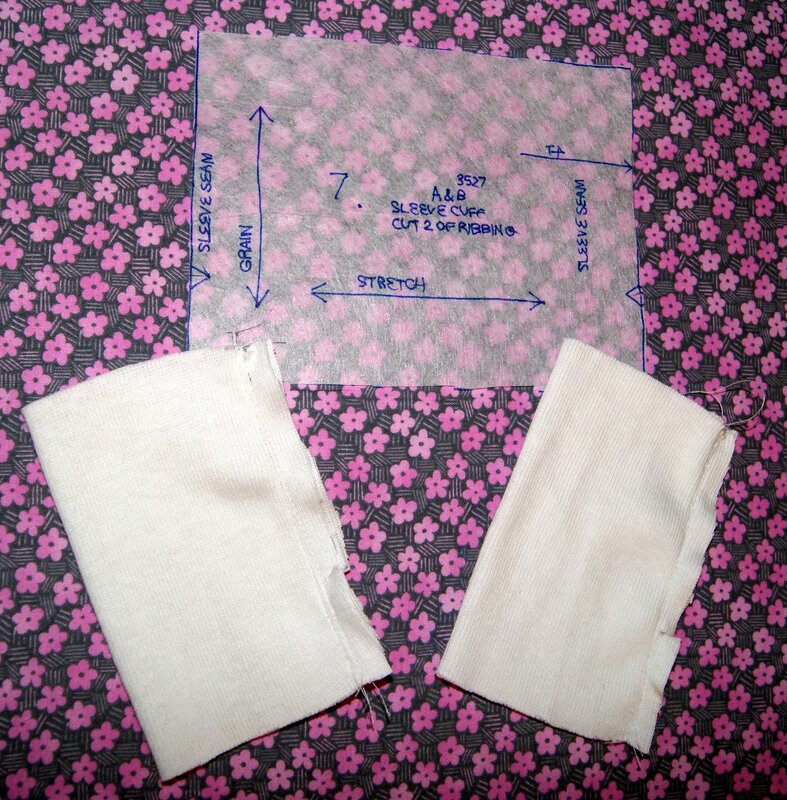 These are the same directions that I use if making a pair of gathered waist pants or capris for little ones. Actually, this is a great sewing project for a young person to make for themselves with adult supervision to keep Stitching4Ever alive! 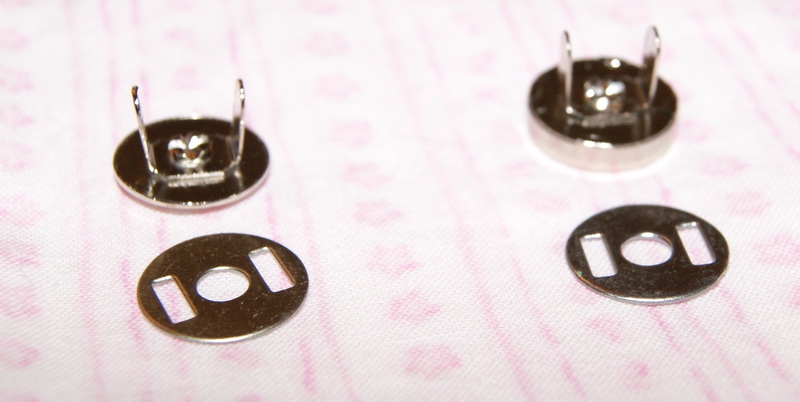 Aren’t those little magnetic clasps wonderful for totes, purses and other handmade projects. However, they never seem to come with directions on how to put them in place. I have used them many times for various projects and find they work just great and I love using them. If you have never used them before, they come as a set with one thin pronged piece, one thicker pronged piece and two thin circles which are actually your back supports or washers. You first need to determine exactly where you want the clasp to be placed. If you are following a pattern, there is probably a placement mark for you to use. 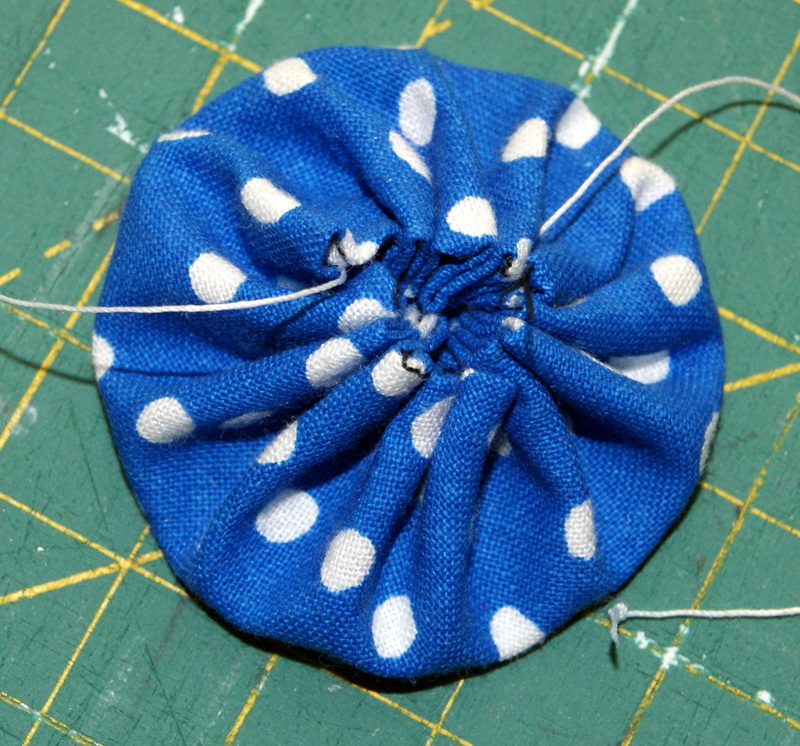 However, if you are designing your own project, I have found that installing the center of the clasp 1 1/4″ from the bottom unfinished edge leaves room enough for a 1/2″ seam allowance using your regular presser foot on your sewing machine and keeps the clasp close to the finished edge. Also, using the thinner clasp on the front of your bag/project and the larger, thicker clasp on the back portion makes the opening and closing motion work smoothly. Now with all that said, I mark the center of the front piece 1 1/4″ from the bottom and place the thin round circle at that point. Take a sharp pencil and make a small dot in the center and draw two small lines inside the rectangle cutouts. These are placement markings and will be covered up after you have installed the clasp. 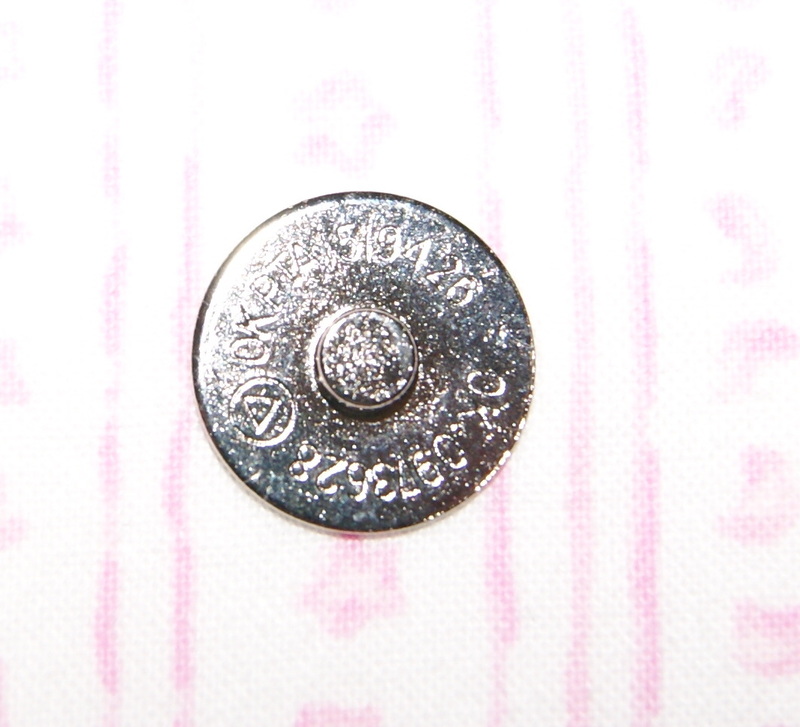 Next, I take a pin and insert it on the front of my material pinning it from line to line. 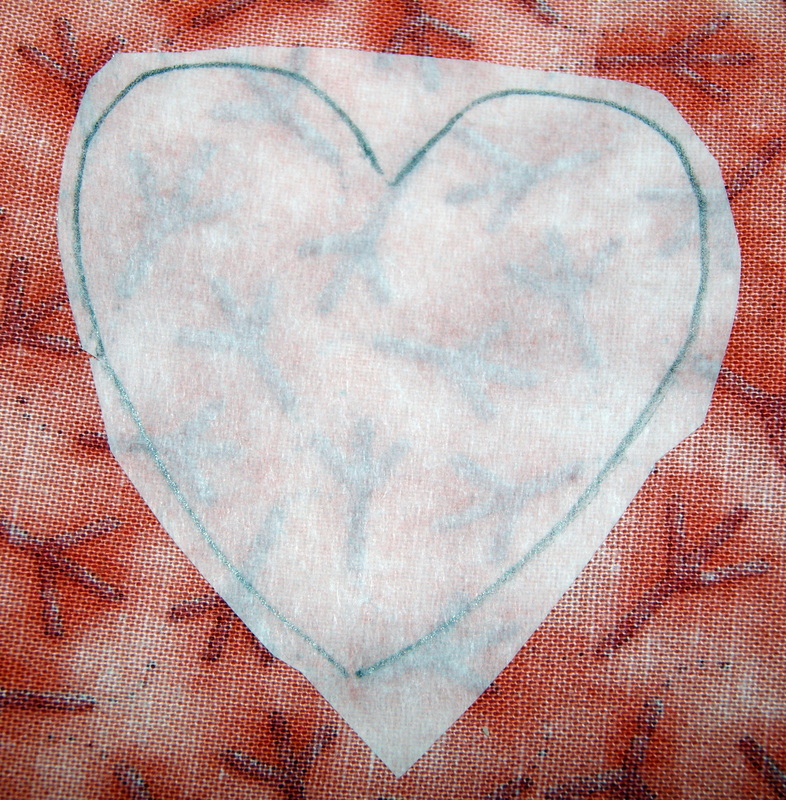 Flip my fabric over and draw a pencil line along the pinned area. This is only for a marking reference for me to make sure that I iron on my supporting pellon in the proper place. I do like to use two layers of a medium weight, fusible pellon to give extra support behind the clasp because that clasp takes a lot of abuse from opening and closing. 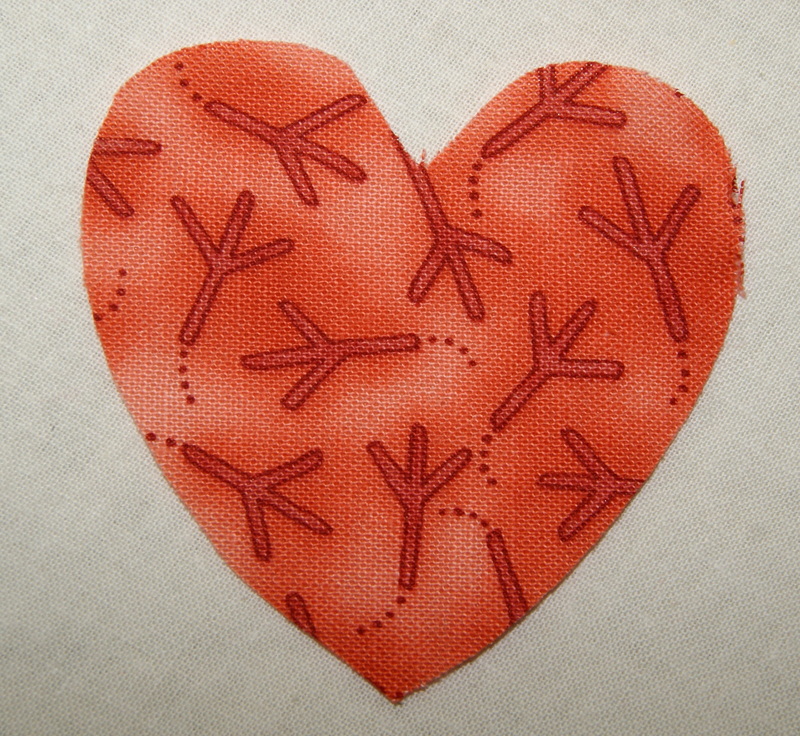 I cut out my pellon roughly in 1″ squares. Basically, I eyeball my cut size but I want it big enough to support the clasp and washer. 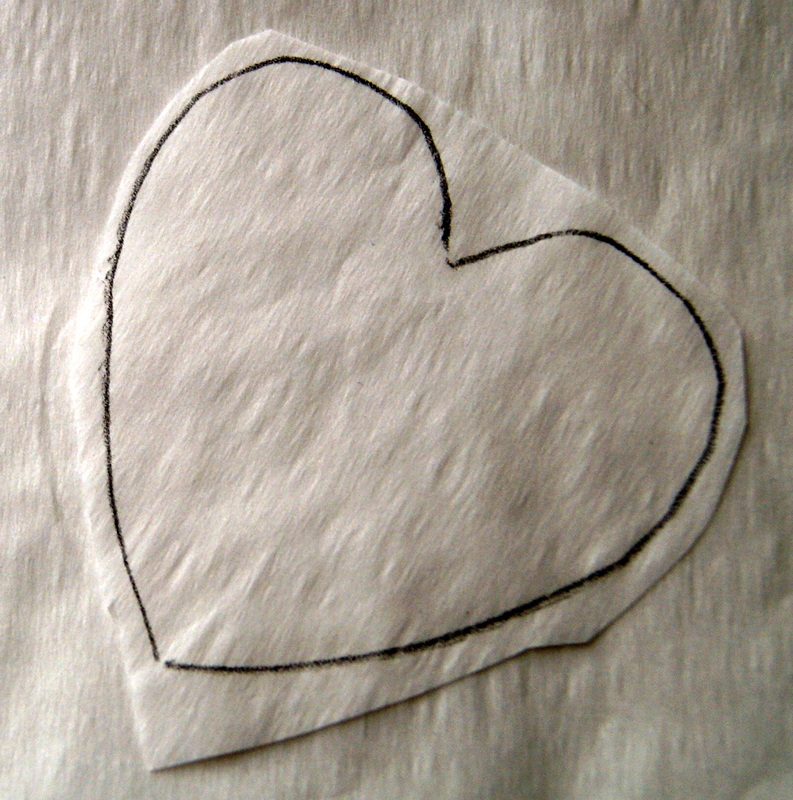 It is a great way to use up some very small scraps that would otherwise be tossed!! After making all my pencil marks as stated above, I now will iron the pellon onto the wrong side of my fabric. Iron one piece of pellon on top of the other piece according to your fusible directions. 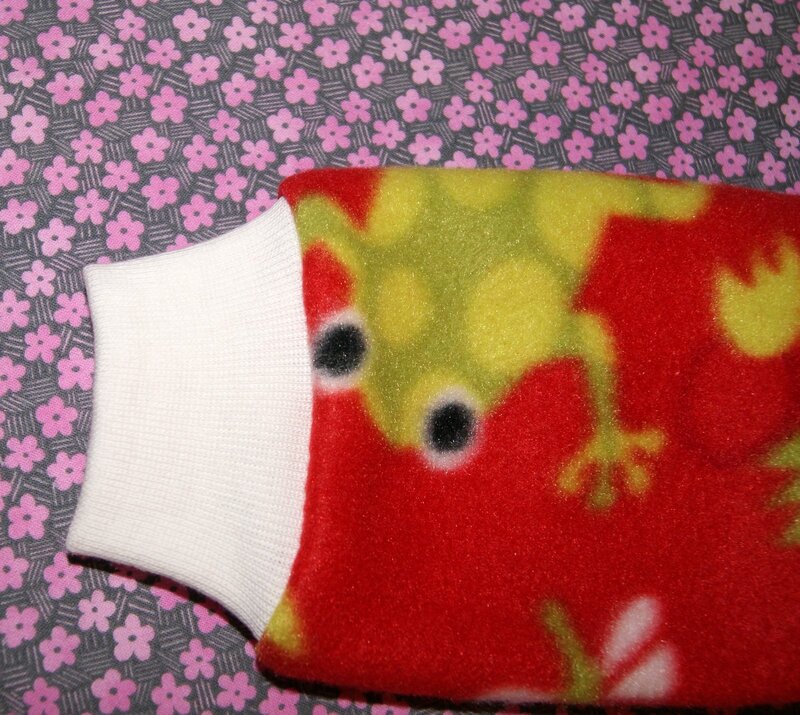 Now here’s a great use for that seam ripper other than removing stitches. 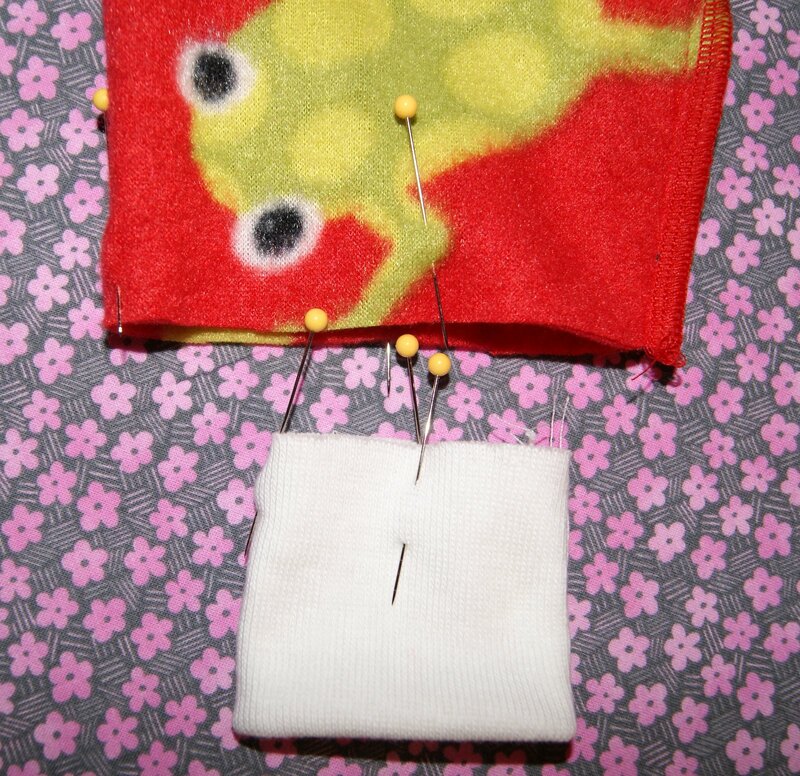 I stick the seam ripper through the fabric and pellon and slide it down very carefully following my pencil lines, which are only about 1/8″ long. Do that again on the other pencil line. 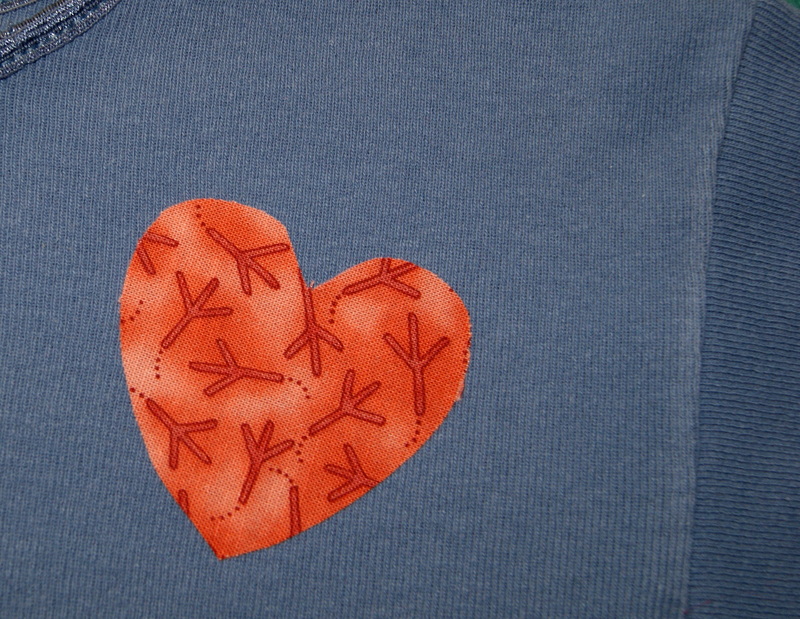 Take the thin clasp with the prongs and push the prongs through the openings you just made. 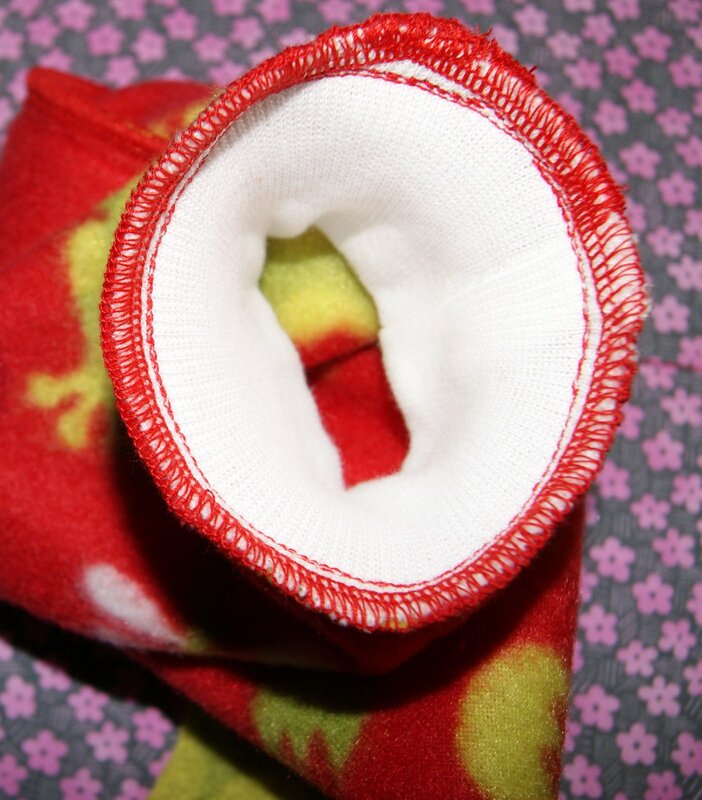 Turn it over and place the back support circle onto the prongs and fold over those prongs. 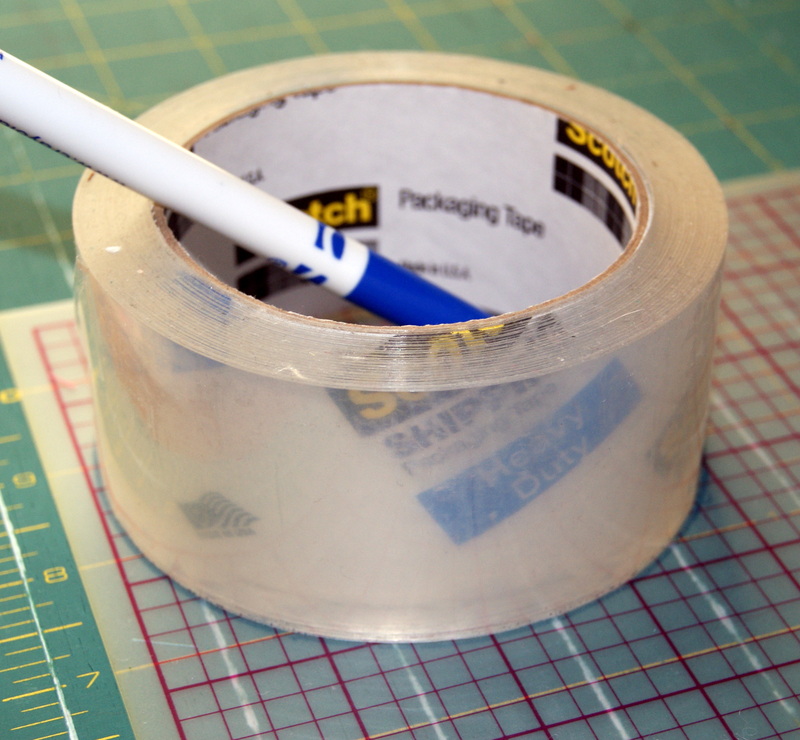 Finding the proper tool to do this job was somewhat challenging but I keep a small, wooden 6″ ruler in my sewing accessory box and it is the perfect tool to push those prongs over without hurting your thumbs!! Just place the ruler against one prong and push down and then place it against the other prong and push down. Then I put the ruler over both closed prongs and give it one more push. Viola, you have the front clasp done. Now you need to do the same thing for the back using the thick clasp with prongs. The trick is getting them lined up perfectly. 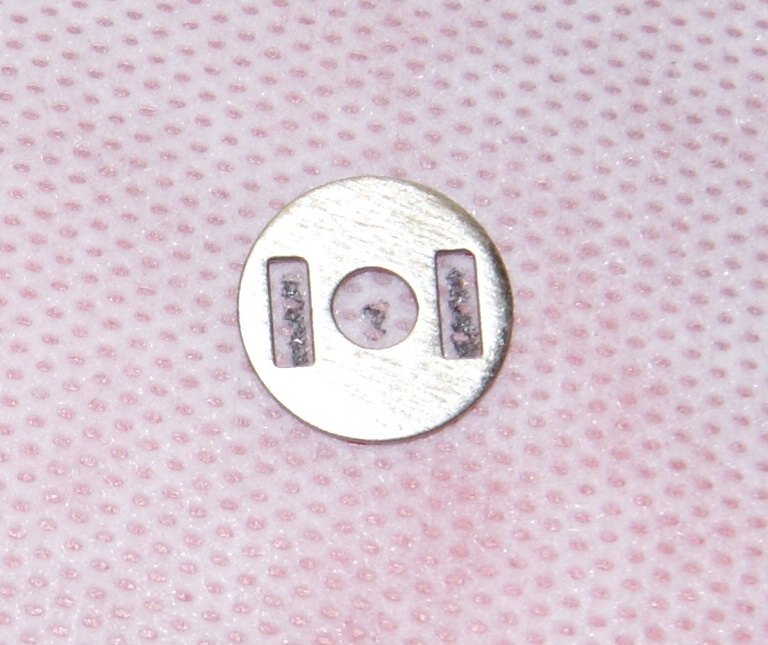 If you take your front piece that already has the clasp installed and lay it on top of the back that it will be attaching to and press firmly, you will have a small indentation from the front clasp and that will be your registration point. 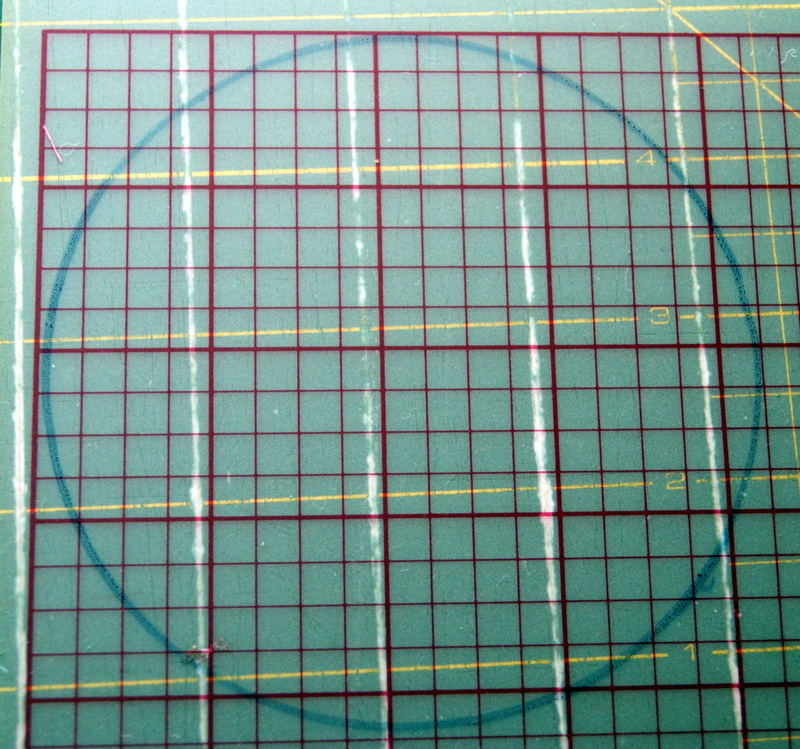 Within that indented circle, place a small pencil dot and center your thin circle back support over your dot and make your markings again. Proceed installing the back clasp just like you did for the front clasp. 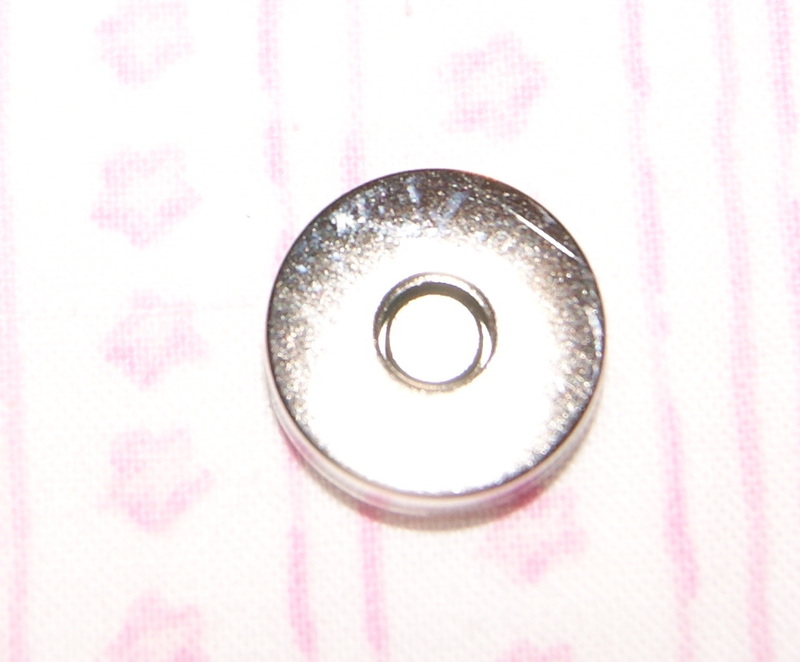 Now you have yourself a lovely little magnetic clasp closure that is great for many different projects. Be creative and dream up some clever uses for them.